IN 2011, Port Moresby only had 600 hotel rooms. Today there are almost 2000 with another 750 on the way – worth over K4.7 billion. Port Moresby has fantastic potential as a tourist destination, but from the conversations I’ve had over the last year, the hotel industry seems to be facing some real challenges because of increased competition and fewer resource projects to boost demand. What will the addition of more hotel developments arriving before APEC mean for the market? To cut through the noise, I spoke to GMs at leading hotels about their take on the hotel and tourism industry in Port Moresby. Glen Murphy is the General Manager of Coral Sea Hotels, the force behind the Grand Papua, the Gateway Hotel and Ela Beach Hotel in Port Moresby. Coral Seas has just upgraded the Ela Beach hotel and upgraded their food and beverage capacities at the Gateway, so Glen is no stranger to the climate the sector is facing this year. 1. In June 2017 there will be a General Election which dramatically reduces Government spending and projects. 2. The inability to pay for goods outside of PNG (due to no foreign exchange) has stopped or severely slowed down projects. Corporate business has fallen with no stimulus to improve. APEC provides some pre event meetings but not significant for the entire market. APEC in 2018 will provide a boost. To counter slower conditions in early 2017, one way hotels are looking to boost the bottom line is through the addition of new dining options. Over the last 12 months alone, we’ve seen more than 20 new restaurants open up across POM – with more on the way. 1. K3 billion 5-star luxury integrated resort at Paga Hill. The development is expected to cover over a massive 67,000 square metres, with between 250 and 300 rooms and 60 - 70 serviced apartments. Foreign investors Shenzhen SEZ Construction and Development Group, China Harbour Engineering Company (CHEC) and Covec are taking the lead in funding and constructing the resort, aiming to be complete by the APEC Summit with construction starting soon. Expected to open later this year, the US$400 million (K1270 million) hotel attached to Star Mountain Plaza will add another 212 rooms to the mix. One of the Hilton’s first major tests in Port Moresby will be hosting a gala dinner on the first night of the APEC Summit, so deadlines for this project are more crucial than ever. 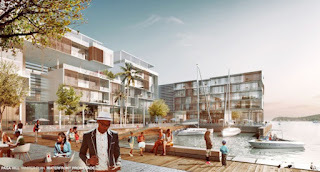 So far, little is known about the MoU signed between Hong Kong property developer Shin Kong Pacific Investment and Kumul Consolidated Holdings. What we do know is that the proposed 5-star hotel in Port Moresby is expected to have about 500 rooms, boosting the number of hotels rooms in the city to more than 2,600 in total. As part of the Ela Beach redevelopment, a new hotel and residential capabilities will be built by CHEC and Cardno Engineering. Works have already begun on the development and are due to be completed along with the Ela Beach four-lane road and APEC Haus. With the city suddenly flooded with extra rooms and fewer resources projects to boost occupancy rates, it’s likely some hotels will be under so much pressure they may even go out of business. In my opinion, the winners here are the consumers: potential guests have more choice than ever before, and can experience superior quality accommodation at a better price after years of comparably high prices to other cities in the region. Without the perception of overpriced rooms, maybe this paves the way for a real win-win situation where a focus on tourism can finally become more of a talking point in Papua New Guinea.